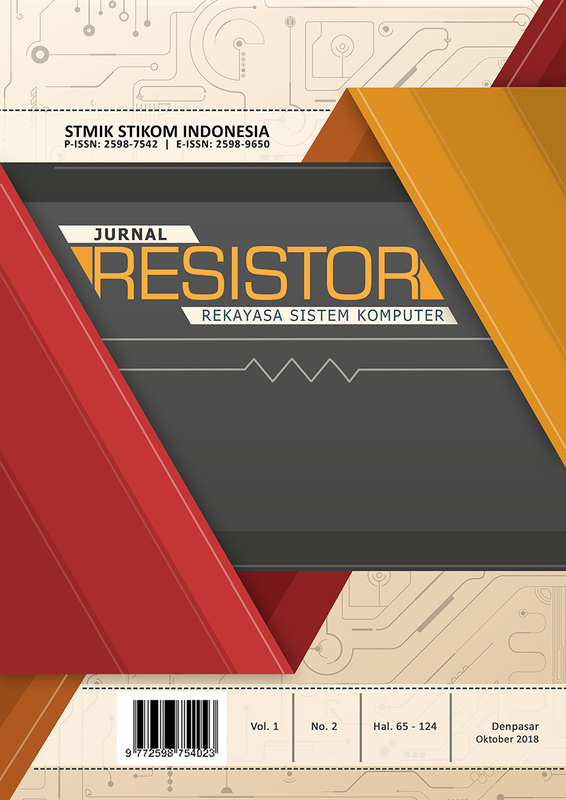 RESISTOR (Rekayasa Sistem Komputer) Journal is a journal managed and published by the Institute for Research and Community Service (LPPM) STMIK STIKOM Indonesia, with e-ISSN 2598-9650 and p-ISSN: 2598-7542. SINTECH Journal was first published in April 2018 and has a publishing period twice in a year, namely in April and October. Focus and scope of RESISTOR Journal includes: Communication, Networking and Broadcasting Power, Energy, and Industry Applications, Signal Processing and Analysis, Computing and Processing,Robotics and Control, Internet of Things, Machine Learning, Network and System Secutrity, Wireless Sensor Network, Mobile Ad-hoc Network, Digital Forensics. All articles in RESISTOR Journal will be processed by the editor through the Online Journal System (OJS), and the author can monitor the entire process in the member area. Articles published in RESISTOR Journal, both in hardcopy and soft copy, are available as open access for educational, research and library purposes, and beyond that purpose, the RESISTOR Journal editorial board is not responsible for copyright infringement.